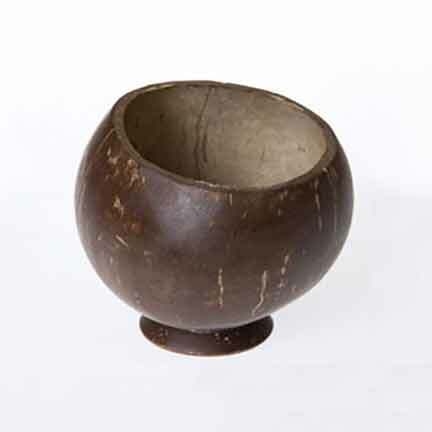 This polished coconut shell cup holds about 12 ounces and measures approximately 4″ x 4″. The polished shell may have dents, cracks, and imperfections. Spice up the Luau Party with a coconut shell Kava cup. What is better to set the mood than sipping drinks at your luau party from a coconut mug? Even when enjoying Kava Kava at home, these coconut shell cups are the perfect way to make the experience more authentic. And, Kava was traditionally consumed out of sanded Coconut Shells. And, when one is drinking Kava, we don’t ask how many Kava drinks we’ve had, we ask how many shells of Kava we’ve had. Holds approximately 12 ounces and stands about 3¾? tall and 3¼? wide. This is an actual, real, coconut. Therefore, it may have cracks, dents and imperfections. This coconut cup is a must have Hawaiian accessory for any tropical theme event. Spice up your Hawaiian Luau, corporate party, wedding, or other tropical theme event with luau party tableware.